Heat oven to 400°F. Place paper baking cup in each of 24 regular-size muffin cups. Beat all ingredients except frosting, candies, cookies and decorating gel in large bowl with electric mixer on low speed 30 seconds, scraping bowl constantly. Beat on high speed 2 minutes, scraping bowl occasionally. Fill cups 1/2 full. Bake 15 to 20 minutes or until toothpick inserted in center of cupcake comes out clean. Remove from pan to wire rack. Cool completely, about 30 minutes. Spread with frosting. 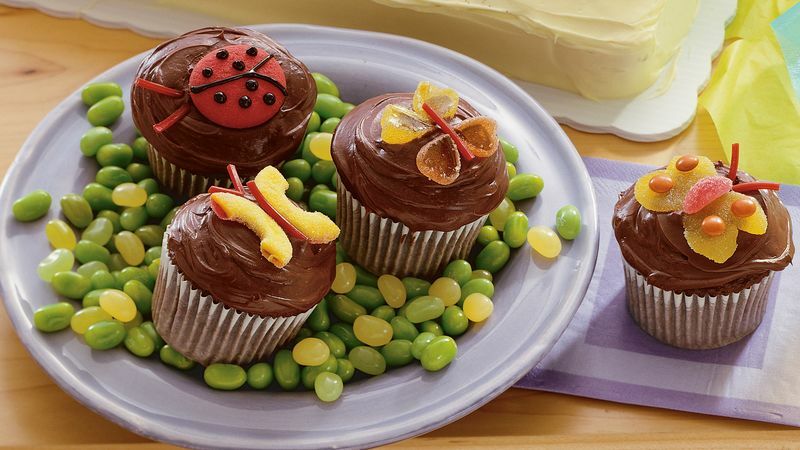 Decorate with candies to look like butterflies and ladybugs .